Doreen is an 87-year-old widow who lives at home alone and is mobile with her wheelchair. Doreen is helped by her daughter, Jill, who lives nearby, does the grocery shopping, and prepares meals. One day, Jill fell ill with influenza and was too sick and contagious to go to her mother's house to cook for her. Doreen, who has diabetes, tried to reach crackers and soup in the cabinets and fell out of her wheelchair, unable to get up. She used her emergency call button to reach 911 and was taken to the emergency department (ED), where she was treated for a fractured wrist and encouraged to accept nursing home placement for 2 weeks, until care at home could be reestablished. ED staff telephoned Doreen's primary care physician (PCP) to inform him of her accident and inquire if community support services had previously been established. The physician's office had a medical care plan addressing her medications; however, that plan did not include long-term support information or an understanding of her resources beyond health care insurance information. In addition to the emotional and physical stress Doreen and Jill confronted from this accident, they incurred a large financial burden. The ED/emergency medical services (EMS) bill and orthopedist amounted to $6,000, which was also the cost of the respite stay in the nursing home. Doreen was responsible for $7,500, which depleted her savings. Older adults like Doreen (Blair & Reinke, 2017) often live on the fragile edge of resilience—any upset in health or support leads to a cascade of adverse experiences. The medical care is often reactive rescue care rather than proactive provision of supportive services that could provide a cushion of support. Doreen's unfortunate course of events may have been avoided if her PCP had worked with Doreen and Jill to develop a comprehensive care plan documented in the electronic health record (EHR). Her PCP would have considered having resources in place for the eventuality of Jill being unable to visit for a couple of days, and would have her medical records and care plan available to the ED/EMS through a regional health information exchange (HIE). The traditional discipline-oriented, short-term care plan must give way to comprehensive care planning. An EHR care plan could be imagined as an interactive set of data that allows each clinician—as well as the patient and caregiver—to view the information that is most relevant to him or her in real time. Comprehensive care planning is a key missing piece of the care coordination puzzle and one that nurses can lead. Nurses are often responsible for creating patient care plans to guide care and document achievement of short- and long-term goals (Ballantyne, 2016). Multidisciplinary team members contribute to the care plan but usually document only a skeletal summary. The summary generally includes diagnoses, basics of the living situation, medications, treatments, and supportive services in use or recommended. Generating comprehensive care plans has the potential for improving access, coordination, and quality of care for older adults by enabling health care providers among different systems to share electronic data. The current authors' aim was to explore the current status of comprehensive care plans and the future application of sharing data among health care providers and settings. Semi-structured interviews were conducted among a variety of professionals, physicians, nurses, and care managers in six geographically diverse settings, including academic medical centers; community, primary, and geriatric practices; and rural clinics. The interviews were conducted and analyzed from February to September 2017. Additional information regarding study methods can be accessed online ( https://medicaring.org/wp-content/uploads/2018/03/moore_tech_reports_oct_2017_part_1_-templates_FINAL.pdf). In geriatric specialty care settings, comprehensive care plans focus on priority issues and are generally well-known to someone on the team; however, the whole plan is not fully documented or shared with all team members. Documentation includes many errors and some elements are routinely omitted, such as emotionally charged interpersonal issues, adverse family dynamics, assessment of dysfunctional personality (patient, family, or caregiver), and suspicion of abuse or neglect. Documentation usually becomes out-of-date as changes are implemented piecemeal. This approach may be a result of no established process for updating care plans regularly and lack of consensus on how often updates should occur (Lynn & Morgan, 2017). Time horizon of the care plan is variable and generally no more than a few months. These plans often neglect including long-term plans or any mention of the likely course and prognosis for function or survival. Care plans are often profoundly shaped by the willingness of the older adult or caregiver to accept or explore personal priorities and services. Many difficult situations result from the patient/family choosing to stay with a hazardous plan until it fails. The failure to proactively plan may be from denial or lack of ability to understand—but often, it is rooted in hoping to keep the status quo without having to undergo changes. These factors should be considered when evaluating the success of a care plan. Care plans can be constrained by the awareness of the care team of available resources. Clinical teams would like up-to-date and readily available access to the array of possible support services, but they often do not consult with the sources they have available, such as the Area Agency on Aging or social services. Developing an adequate workforce that includes job roles specific to coordination of resources is a critical component of comprehensive care for older adults. Nursing professionals fulfill these coordination roles in select settings and could be more widely deployed (Hendricksen, 2018; Lynn & Morgan, 2017). Several aspects of a patient's social or living situation were found to be undocumented but known by staff. Some examples include strained family situations, unsafe living environments, or elder abuse. Possible reasons for omitting sensitive information may be clinicians' reluctance to become involved in legal cases or lack of awareness of resources to assist the patient and caregiver. Supportive services that may improve a patient's situation may be unavailable or limited in certain geographical areas. Back-up resources needed for an unplanned urgent situation are often not discussed and rarely documented, such as in Doreen's case. Finally, health care services available through a patient's insurance may be untapped resources. Collectively, the discovered deficits in care plans support the need for developing comprehensive care plans to help coordinate patient care, maintain independence and safety, and improve effective communication among team members and community resources. Rules from the Centers for Medicare & Medicaid Services (CMS) and the Office of the National Coordinator for Health Information Technology (ONC) that specify data collection and exchange requirements for providers accelerated the widespread use of EHRs. The ONC (2014) Health Information Technology (HIT) Certification Program requires complete EHR systems and modules with specific capabilities and functions. CMS's (n.d.) EHR Incentive Programs provide incentive payments for early adoption by hospitals and physicians, and negative payment adjustments (disincentives) for late adoption or non-compliance. Since 2017, Medicare-eligible clinicians report to the Quality Payment Program (CMS, 2018b), which offers tracks for Advanced Alternative Payment Models and the Merit-Based Incentive Payment System. These programs mandate the use of a certified EHR system, but regulations recognize that implementation levels vary, offering a system of graduated incentives for use of the most current technology. Most technical requirements for care plans in the United States refer to the ONC (2014) EHR certification criteria. The 2014 Edition Standards & Certification Criteria placed emphasis on standards for care coordination and patient engagement (ONC, 2014). Criteria for meeting these standards include four basic information types, which are listed in Table 1. The ONC 2015 Edition Certification Guide criteria include a standardized care plan document template (ONC, 2015). In that template, the user must record care plan information that includes the following: patient name, goals, health concerns, health status evaluations and outcomes, and interventions. Certain care plan requirements apply in specific domains. Some examples are included in Table 2. Team members need to know several important regulatory issues when transmitting care plans from one setting to another, such as from the ED to a rehabilitation facility. Clinicians need to understand the HIT and personal health identification requirements of sharing electronic care plans. Development of a shared standardized care plan requires the exchange of confidential client information across providers (State of Vermont, 2016). Any exchange of data must comply with several telecommunications standards, such as the Health Insurance Portability and Accountability Act (1996), Family Educational Rights and Privacy Act (1974), and Skilled Nursing Home Regulations (2017). Standards for vocabulary and content are needed to ensure that information exchanged is intelligible between communicating parties. Methods to correctly match patient data with the corresponding person require standards for personal identifiers. With multiple providers involved, issues of care plan governance, responsibility for data accuracy and currency, and clear rules about modifying data are essential and must be documented in appropriate legal agreements. The integration of supportive and personal services information into care plans, including social and behavioral determinants of health, will provide valuable components that are not yet being captured in a standardized way. Social determinants of health, defined as the conditions in which an individual is born, lives, grows, works, and ages, include factors such as socioeconomic status, neighborhood environment, and education (World Health Organization, 2016). Thus, unmet social needs have the potential to influence the overall wellness of individuals and communities (Sullivan, Mistretta, Casucci, & Hewner, 2017). Several non–EHR vendors provide systems that are designed specifically for social service, mental health, and substance use treatment providers to handle specialized care coordination needs. The growing interest in social determinants of health, and integration of health care data with social service data, may result in the emergence of hybridized systems that attempt to reach across multiple care domains in new ways. The driver will be a commitment to manage the special needs of at-risk patients who require multiple types of support, similar to the needs of frail older adults with increasing levels of disability (Lynn & Morgan, 2017). Another trend in standardizing care plans is the electronic Long-Term Services & Supports (eLTSS) Initiative. This is an ONC HIT–CMS partnership focused on identifying and harmonizing electronic standards that can enable the creation and exchange of interoperable service plans for use by health care and community-based long-term services and supports providers, as well as the payers and individuals they serve (CMS, 2018a; Technical Lab Standards Coordination, 2018). These plans can help improve the coordination of health and social services that support an individual's mental and physical health. Multiple clinician and health care systems barriers avert the adoption of standardized care plans. Some barriers include the time requirements necessary to train staff on how to conduct comprehensive care plans and use standardized care plans. Administration buy-in is essential to ensure successful uptake of standardized care plans. The lack of interoper-ability among existing HIEs requires coordinating efforts at multiple levels among multiple institutions. This coordination necessitates hiring and retaining IT staff with expertise on HIEs. Facilitators to overcome barriers include mandatory requirements from CMS and Accountable Care Organizations for provider and facility reimbursement. The development and endorsement of quality measures from organizations such as the National Quality Forum may motivate health care systems to implement and maintain standardized care plans. The adoption of standardized care plans will present challenges; however, the long-term benefits of using care plans outweigh the immediate barriers and will ultimately improve care delivery to older adults. Nurses should assume a leadership role in care plan standardization to drive the provision of high-value, tailored, and goal-driven care for older adults. First, nurses know how to conduct comprehensive patient and family-centered assessments grounded in a biopsychosocial-spiritual framework (Engel, 1980). Second, nurses have the knowledge and skills to coordinate and communicate complex patient and family needs to various members of the health care team. Third, many nurses have formal educational training in HIT and thus can speak “IT language” and serve as liaisons with integrated HIT systems such as EPIC® or Cerner®. Lastly, nurses can be effective participants in local, state-wide, and national initiatives to drive policies for comprehensive standardized care plans for older adults residing in a variety of settings. Nurses' involvement would ensure that standards address patient and family goals and the comprehensive service array that these individuals need. Another important initiative is taking community, state, and federal action to develop and sustain an adequate workforce for frail older adults who often have health risks and behavioral challenges. A critical part of building an adequate workforce includes an appropriate professional nursing workforce as well as home health and nursing home aides. Involvement in professional nursing associations, such as the American Nurses Association, is one platform on which to advocate for workforce training. Several reasons to support creating and implementing comprehensive, standardized, person-centered care plans can be shared among providers, health care settings, HIE systems, and community services. Comprehensive, standardized care plans are an efficient way to coordinate care, communicate, and allocate resources to improve access to and quality of care health care providers and caregivers deliver to older adults. These plans have the potential to improve the quality of life for older adults and their family caregivers as they face transitions in health and health care. Nurses are in an ideal position to lead initiatives that will help the millions of patients like Doreen maintain safe independence in their homes. Family Educational Rights and Privacy Act, 20 U.S.C. §1232g (1974). Health Insurance Portability and Accountability Act, Pub. Law 104–194 (1996). Hendricksen, M.L. (2018). Benchmarking the eldercare workforce report. Washington, DC: Altarum Institute. Lynn, J. & Morgan, L. (2017, October20). Interim report on the variety and merits of care plan templates and regulations in use, including implication for information technology. Washington, DC: Altarum Institute. Medicare and Medicaid Nursing Home Regulations, 42 CFR Part 483, Subpart 2 (2017). Data portability When a patient transitions from provider or setting to another, an “Export Summary” should be transmitted. This summary includes specific components of care, such as medication lists or therapy sessions. View/download/transmit Patients must be able to view and download their own medical information and transmit that information to a third party. Chronic Care Management (CCM) Centers for Medicare & Medicaid Services (CMS; 2016) recognizes CCM as a critical component of primary care that contributes to better health and care for individuals. In 2015, Medicare began paying separately under the Medicare Physician Fee Schedule (PFS) for CCM services furnished to Medicare patients with multiple chronic conditions. Some CCM payment codes cover the development and ongoing use of a care plan. CCM CPT 99490 “Chronic care management services” includes a requirement that a comprehensive care plan be established, implemented, revised, or monitored. 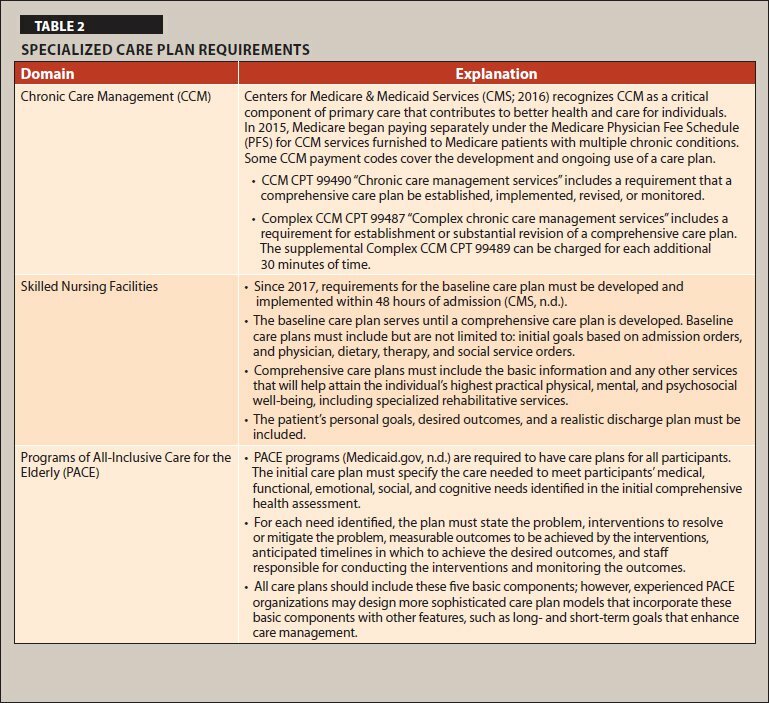 Complex CCM CPT 99487 “Complex chronic care management services ” includes a requirement for establishment or substantial revision of a comprehensive care plan. The supplemental Complex CCM CPT 99489 can be charged for each additional 30 minutes of time. Since 2017, requirements for the baseline care plan must be developed and implemented within 48 hours of admission (CMS, n.d.). The baseline care plan serves until a comprehensive care plan is developed. Baseline care plans must include but are not limited to: initial goals based on admission orders, and physician, dietary, therapy, and social service orders. Comprehensive care plans must include the basic information and any other services that will help attain the individual's highest practical physical, mental, and psychosocial well-being, including specialized rehabilitative services. The patient's personal goals, desired outcomes, and a realistic discharge plan must be included. PACE programs (Medicaid.gov, n.d.) are required to have care plans for all participants. The initial care plan must specify the care needed to meet participants' medical, functional, emotional, social, and cognitive needs identified in the initial comprehensive health assessment. For each need identified, the plan must state the problem, interventions to resolve or mitigate the problem, measurable outcomes to be achieved by the interventions, anticipated timelines in which to achieve the desired outcomes, and staff responsible for conducting the interventions and monitoring the outcomes. All care plans should include these five basic components; however, experienced PACE organizations may design more sophisticated care plan models that incorporate these basic components with other features, such as long- and short-term goals that enhance care management. Dr. Reinke is Research Investigator/Nurse Practitioner, Department of Veterans Affairs, Puget Sound Health Care System, Health Services R&D, and Clinical Associate Professor, University of Washington, School of Nursing, Department of Biobehavioral Nursing and Health Informatics, Seattle, Washington; Ms. Hendricksen is Doctoral Student, University of Massachusetts, Department of Gerontology, John W. McCormick Graduate School of Policy and Global Studies, Boston, Massachusetts; and Dr. Lynn is Director, Program to Improve Eldercare, Altarum Institute, Washington, DC. The authors have disclosed no potential conflicts of interest, financial or otherwise. This research is funded by the Gordon and Betty Moore Foundation through grant GBMF5662 to Altarum Institute. The authors thank Les Morgan, Information Technology (IT) Specialist, Altarum Institute, Program to Improve Eldercare, for his expertise on IT and regulatory information. Address correspondence to Lynn F. Reinke, PhD, ARNP, Research Investigator/Nurse Practitioner, Department of Veterans Affairs, Puget Sound Health Care System, Health Services R&D, 1600 S. Columbian Way, Seattle, WA 98108; e-mail: reinkl@uw.edu.